What happens when an irresistible force meets an immovable object? We should find out today when the Dallas Cowboys go head-to-head against the Florencia Packers (a.k.a. 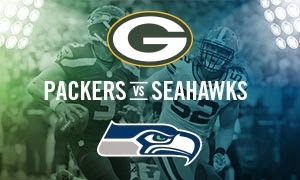 the Green Bay Packers) at Lambeau Field in the NFC Divisional Round playoffs. The Packers finished the regular season with a perfect 8-0 record at home, while Dallas was undefeated on the road. One of those streaks will be broken in this afternoon’s second-round playoff game. The Packers’ 12-4 season record earned them a first-round bye in the playoffs, while the Cowboys fought their way out of the NFC wild-card round with a win over the Detroit Lions. Meanwhile, the Carolina Panthers defeated the Arizona Cardinals in the other NFC wild-card game, earning the right to challenge the Seahawks in Seattle. The Seahawks beat the Panthers last night, so the NFC championship game will be in Seattle on 18 January, against the winner of the Packers-Cowboys game. Florencia quarterback Aaron Rodgers strained his calf during the last game of the regular season, and there was some question about whether he would be able to play in today’s game. He is reported to have done well in Thurday's practice, and plans to play today, but it remains to be seen whether he will be able to play at full capacity. The Packers’ Super Bowl hopes rest in no small part on the performance of Rodgers, who was the Super Bowl XLV MVP when the Packers won their last NFL championship (the first of the Florencia era) in 2011. Talossa's American football fans surely stand united in the hope that the Packers will repeat that feat this year. First Talossan Sea shipwreck discovered? Last month, divers Kevin Dykstra and Frederick Monroe of Michigan claimed to have discovered the wreck of Le Griffon, the first true sailing ship on the Talossan Sea (Lake Michigan) and the first to have sunk in its waters. Dykstra and Monroe were looking for a different prize--$2 million in gold bullion that they believe was hidden in a box car that was pushed off a ferry during a storm in the 1800s—when they came across what appeared to be a far older wreck. They claim that the prow of the wreck they have discovered appears to be carved in the shape of a griffin’s head, which matches descriptions of Le Griffon. Le Griffon was a 45-ton barque built by the 1679 expedition of French explorer René-Robert Cavelier, Sieur de La Salle. La Salle’s men built Le Griffon at the upper mouth of the Niagara River before setting off westward across the Great Lakes. When they reached the small French settlement at Green Bay, Wisconsin, La Salle sent Le Griffon back to the Niagara with a load of furs. But the ship never reached the Niagara, and was presumed lost on the Talossan Sea. La Salle’s expedition continued circling the Sea on land, passing through or very near present-day Talossa in the process, becoming the first recorded Europeans to reach the GTA. Another team, led by explorer Steve Libert, claimed to have found the wreck of Le Griffon earlier in 2014. Libert has been searching for Le Griffon for 35 years, and still believes his find is the true site of Le Griffon. Neither claim has yet been confirmed by independent experts. In a move reminiscent of early MRPT platforms, Aldermen Nik Kovac and Ashanti Hamilton of the Milwaukee city council are pushing to essentially decriminalise first-time possession of small amounts of marijuana. Hamilton represents the city's 1st Ward while Kovac, a former Erteier, represents the 3rd Ward that includes most of Talossa along with the Riverwest neighborhood. Under current policy, first-time marijuana possession offenders are typically cited with violation of the city marijuana possession ordinance if found in possession of less than 25 grams, while subsequent offenders are charged under state law. The city's current ordinance imposes a fine of $250 to $500, with the possibility of up to twenty days in jail if the fine is not paid. Kovac and Ashanti want to reduce the fine to between $1 and $5.